Is universal coverage via social health insurance financially feasible in Swaziland? OBJECTIVE: The Government of Swaziland decided to explore the feasibility of social health insurance (SHI) in order to enhance universal access to health services. We assess the financial feasibility of a possible SHI scheme in Swaziland. The SHI scenario presented is one that mobilises resources additional to the maintained Ministry of Health and Social Welfare (MOHSW) budget. It is designed to increase prepayment, enhance overall health financing equity, finance quality improvements in health care, and eventually cover the entire population. METHODS: The financial feasibility assessment consists of calculating and projecting revenues and expenditures of the SHI scheme from 2008 to 2018. SimIns, a health insurance simulation software, was used. Quantitative data from government and other sources and qualitative data from discussions with health financing stakeholders were gathered. Policy assumptions were jointly developed with and agreed upon by a MOHSW team. RESULTS AND CONCLUSION: SHI would take up an increasing proportion of total health expenditure over the simulation period and become the dominant health financing mechanism. In principle, and on the basis of the assumed policy variables, universal coverage could be reached within 6 years through the implementation of an SHI scheme based on a mix of contributory and tax financing. Contribution rates for formal sector employees would amount to 7% of salaries and the Ministry of Health and Social Welfare budget would need to be maintained. Government health expenditure including social health insurance would increase from 6% in 2008 to 11% in 2018. The Ministry of Health and Social Welfare (MOHSW) of Swaziland has investigated the option of an SHI scheme through a feasibility assessment, in the pursuit of addressing strong requests by civil servants to provide health insurance for them as well as providing coverage for other population groups. Swaziland's population is approximately 1 million, with 48% being classified as very poor (2001 data, latest available estimation),2 and the country has a very high HIV prevalence rate of 24.3% for adults aged 15 -49 (2007 data); 42% of those with advanced HIV/AIDS infection are covered by antiretroviral therapy (ART).3 Overall, government health care provision is organised via districts, but with little decentralisation, and it is considered of insufficient quality. Current total health expenditure per capita is estimated at US$151 (at exchange rate 7.79 emalangeni, 2008 average); 65% is tax-financed, whereas 35% is private health expenditure. The latter includes private health insurance (6%), OOP expenditure (15%), funding from non-profit institutions (9%), and other (5%).4 Private health insurance is well established, particularly among formal sector employees, with an estimated 6% of the working population having an insurance plan.5 It is noteworthy that general government expenditure on health as a share of general government expenditure is relatively low (6% in 2008)6 and is thus far below the 15% goal of the Abuja Declaration. This article discusses the results and implications of the financial feasibility assessment of a potential SHI scheme for Swaziland. This is a first and important step for a government to take in assessing wider feasibility issues of an SHI scheme, including technical, organisational and political feasibility and implementation capacity. The SHI scenario presented is that of an SHI scheme that mobilises resources additional to the maintained MOHSW budget (adjusted for real gross domestic product growth and inflation). It is designed to: (i) increase prepayment via SHI contributions; (ii) enhance overall health financing equity; and (iii) eventually cover the entire population within 6 years, all being entitled to the same defined benefit package, including outpatient and inpatient care at government, mission and private sector facilities with varying levels of co-payments. Formal sector employees and pensioners are to pay a fixed contribution, while informal sector workers, most of whom are exempted, contribute a flat amount. An SHI financial feasibility assessment examines whether both household contributions and available government resources for health are sufficient and sustainable and whether and how they can eventually be expanded under an SHI policy to reach universal coverage. The financial feasibility assessment consists of calculating and projecting revenues and expenditures of the SHI scheme from 2008 (baseline year) to 2018 (year 10). SimIns, a health insurance simulation software, is used.7 SimIns calculates projected health insurance expenditure by multiplying: (i) projected numbers of insured members; (ii) their projected health service utilisation rates; and (iii) the projected costs of the health services (i.e. remuneration rates paid to providers) included in the benefit package. It derives projected revenues by multiplying: (i) projected numbers of insured members by (iv) their respective contributions set. 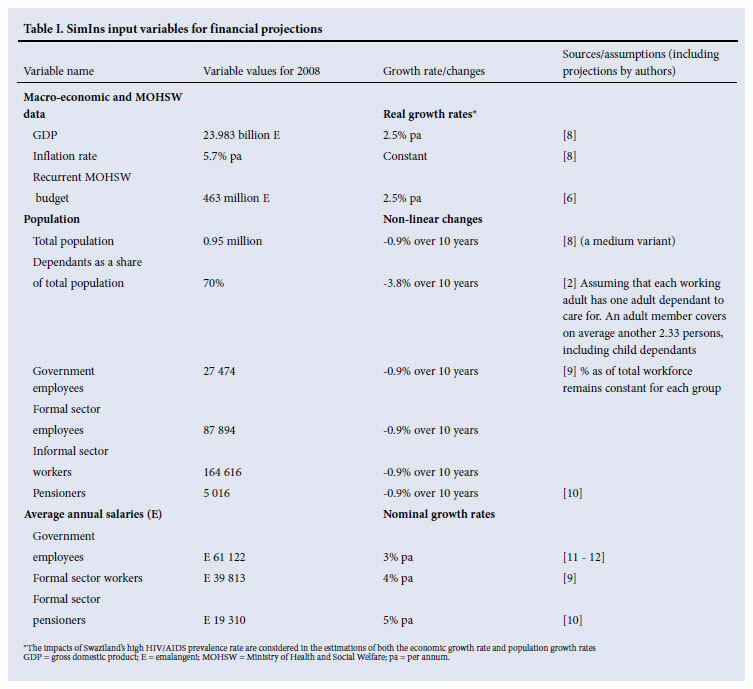 Table II summarises the SimIns variables that express revenue and expenditure-related policy assumptions about the insurance design, i.e. coverage and contribution rates, benefit package composition, unit costs (as provider remuneration rates) and co-payment rates, with more explanations in the text below. 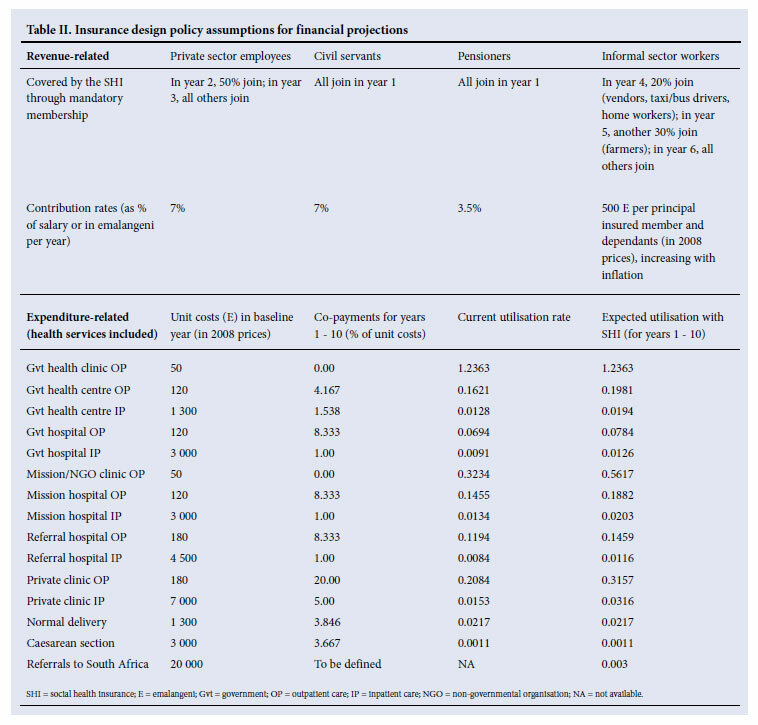 Unit costs are based on a top-down costing study for government health facilities undertaken by the authors (for further methodological explanations see Mathauer et al.5), on comparisons with user charges and reimbursement rates for the private sector5 and data on referrals to South Africa.13 With this method, all services currently provided at government and mission facilities would be part of the benefit package. However, a positive list of health services would eventually need to be established. Current utilisation rates are calculated based on data from MOHSW.14 An assumed price elasticity of demand of -0.32, an estimation available from an earlier study in Swaziland,15 was applied to project an increase in utilisation due to SHI coverage, lower co-payment rates under the SHI scheme, and increased health service quality. Small co-payments were considered necessary to enhance rational consumption of health services. ART is currently largely financed through donors, and it is assumed in this scenario that scaling up ART coverage will be matched with sufficient funding. Stakeholder discussions therefore concluded that ART would not be integrated in the SHI benefit package. The identified need to improve quality of care is simulated by increases in real remuneration rates by 40% for health services provided in government and NGO/mission health facilities which would be realised at the end of the first 6 years of the projection period. This reflects the objective to allocate additional funds into the health system to give policy-makers the financial means to put in place concrete quality improvement measures, including the placement of sufficient and skilled staff and investments in infrastructure and supply systems. Private health sector co-payment rates under the SHI scheme are set at an overall higher level than at government and non-governmental organisation (NGO)/mission health facilities. This reflects the difference in average unit costs between government NGO/mission health services on the one hand and private sector health services on the other. In addition to health service expenditure, administration costs and reserve payments must be taken into account; these are estimated to be 10% and 4% of total annual SHI expenditure, respectively. For the principal insured member from the informal sector and his/her on average 2.33 covered dependants, the MOHSW team considered the following policy assumptions as affordable: (i) flat contribution rates would be set at about 70% of the current average OOP expenditure for health; and (ii) co-payments would be much smaller than currently in place (based on inflation-adjusted 2001 household survey data on OOP health expenditure).2 In view of the presumed decrease in the poverty rate, the assumption of the MOHSW team was that by year 6, 40% of all informal sector workers (i.e. 23% of the total population) would need to be exempted from contributions and co-payments. Exemption rules could build upon existing community targeting mechanisms to be further developed for this purpose.5 Coverage expansion into the informal sector could move along occupational groups (Table II). Fig. 1 depicts the gradual extension of population coverage until universal coverage is reached within 6 years. 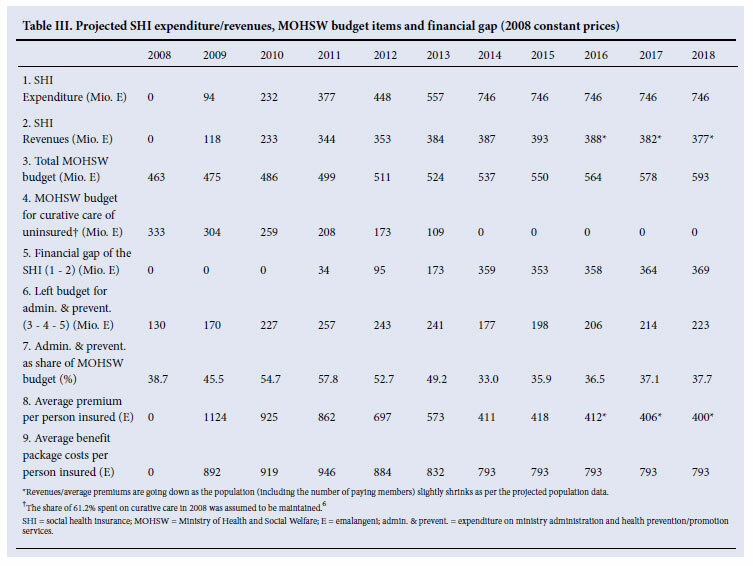 Table III presents the financial situation of the SHI fund and the MOHSW (details of the simulation results available from the first author). SHI revenue and expenditure for all curative care incurred by its members are shown in Table III, revealing a financial gap (line 5). It increases substantially over the projection period and would exist beyond the projection period, but it would not be expected to grow wider under the above assumptions. This gap is of no surprise. The contribution rates are set at levels that are too modest compared with the SHI average benefit package costs per person, and also in light of the high dependency ratio (lines 8 and 9). In addition, 23% of the population are exempted from paying contributions and co-payments in this scenario. There is some degree of cross-subsidisation by the better-off employees whose average contributions exceed their average health care costs. However, it has also been assumed that resources from MOHSW are used to ensure and finance delivery of the SHI benefit package to the exempted and low-income members and thus to meet the financial gap. Furthermore, during the transition process to universal coverage, more MOHSW resources will remain for the ministry administration and preventive/promotive health care (line 7). Fig. 2 shows the resulting structure of total health expenditure of this SHI policy scenario. 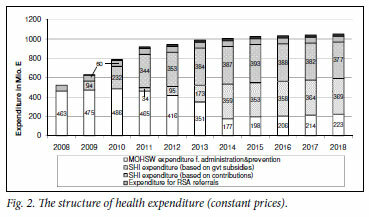 It is clear that SHI (dotted and striped area) would take up an increasing proportion of total health expenditure over the simulation period and become the dominant health financing mechanism. Much of the SHI expenditure would be financed by government subsidies (supposedly from the MOHSW budget for curative care - striped area). For lack of data, any residual private health expenditure (e.g. on private health insurance, self-treatment, payments to traditional healers) is not considered here. Total government health expenditure including SHI expenditure would thus increase to 11% of total government expenditure in 2018, up from 6% in 2008 (estimates based on 2008 data4,6). This SHI scenario is designed with the goal of achieving universal coverage over 6 years. It would contribute considerably to achieving equity in access and health financing. Everyone would be eventually covered with the same access to the same benefit package. Contributions are related to capacity to pay, in that government/ formal sector employees and pensioners pay the same proportion of their salary, the exception being the flat contributions of the informal sector workers. The very poor, 23% of the total population, would be exempted from paying contributions and co-payments. OOP expenditure would be substantially reduced, particularly for the poor, once covered by the SHI scheme. Many low-income workers from the formal and informal sectors and civil servants of lower grades would pay no more for health care than before. In fact, their current OOP expenditure would be turned into prepayment. The design of this SHI scheme is more comprehensive and equitable than a medical aid scheme strictly for civil servants, which would provide financial risk protection to a small population group only. The same holds for private health insurance, which is only affordable to the better-off. Yet, in the case of a SHI scheme, there would be a new role for the (already existing) private health insurance companies, namely offering top-up plans to cover health and health-related services above the standard benefit package (e.g. private hospital rooms with more amenities, better food, non-essential health care such as acne treatment, access to a wider range of health services in South Africa). The opting-out option, i.e. allowing people to purchase private health insurance plans instead of being a member of the SHI scheme, is not recommendable, as the solidarity principle would be undermined. Establishing a permanent stand-alone medical aid scheme for civil servants would unfavourably affect the feasibility of a SHI scheme for the remaining population. 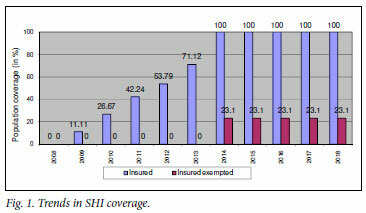 In principle, and on the basis of the assumed policy variables, universal (100%) population coverage could be reached within 6 years through implementing an SHI scheme based on a mix of contributory financing and government subsidies. However, the MOHSW budget would need to be maintained. Such a financing scheme is much more comprehensive and equitable than other proposals, such as a medical aid scheme for civil servants only or the existing private health insurance plans for high-income earners. The SimIns tool constitutes an appropriate starting point to reflect on the feasibility of a SHI. The financial projections are based on estimated input variables and assumed policy variables that must be further reviewed, adjusted and refined over the projection period in line with the actual developments. Likewise, a continued stakeholder consensus building is required for a further fine-tuning of policy assumptions and decisions. This would serve to strengthen the validity of the financial feasibility results. We emphasise again that a financial projection scenario is only one part of an SHI feasibility assessment. A technical and overall capacity assessment as well as an analysis of political feasibility and commitment is equally relevant. It requires that legislation and the institutional and organisational structure must be put in place. It is also requires willingness on the part of formal private-sector employees and civil servants to accept the solidarity principle and to contribute according to capacity to pay. Additional important challenges include achieving a substantial and relatively quick quality improvement, including sufficient and skilled staff, infrastructure upgrading and better supply systems; building up of the administrative capacity required for the operation of an SHI scheme; and providing information and awareness raising for the population to foster the understanding of the principles of SHI with its advantages as well as challenges. A social dialogue on SHI aimed at building widespread consensus would also be needed. This article contains the views of the authors only and does not represent the decisions or the stated policies of affiliated organisations. There are no conflicts of interest.